After graduating from the U.S. Naval Academy (1953) and serving his required tour of duty, he resigned his commission to become a salesperson for Inernational Business Machines Corp. Understanding that future sales in the computing would be for services and software to run computers rather than the computers themselves, Perot went to work for himself, establishing Electronic Data Systems (EDS) in Dallas (1962). 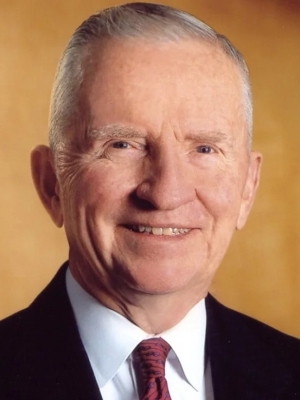 The company made Perot a multimillionaire, then a billionaire when he took the company public in 1968. EDS was purchased by General Motors in 1984, and Perot won a seat on the GM board, but by 1986 his conflicts with GM management led him to resign the seat. He started Perot Systems in 1988. As his wealth grew, so did his desire to be of service to his country. He began a crusade to lobby for the release of American POWs in Vietnam in 1969, then in 1978 financed and arranged for a commando raid to rescue two EDS employees from and Iranian jail. The adventure was memorialized in the novel and film On Wings of Eagles (1986). He mounted two unsuccessful presidential bids as an independent, first in 1992 then in 1996, but he lost credibility with his considerable support base when he withdrew from the '92 race in July, then re-entered in October. He garnered 19% of the popular vote in '92, and 8% in '96, testimony to voters' disillusionment with the traditional two-party system. WA District 5 - Nov 08, 1994 R George R. Nethercutt, Jr.